That was the topic of my talk at OpenWorld this year. 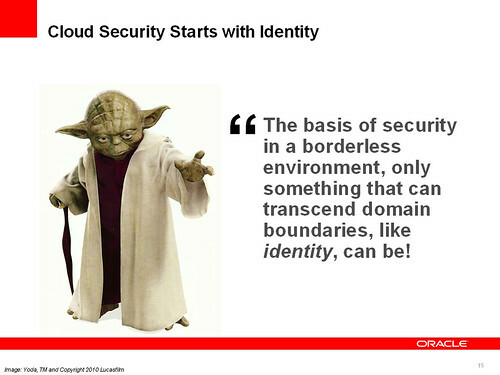 Fitting, I think, considering the emphasis that was put on Cloud Computing at OOW this year, starting with Larry’s opening keynote on Sunday. In my session, I talked about how, thanks in large part to the emergence of cloud computing, enterprises are moving towards a borderless IT infrastructure that is going to change how security is done. The traditional mechanisms of security that are built on topology are going to have to be replaced by a security architecture built on the constant that can actually flow across domain boundaries – identity. Yoda himself made an appearance to make the point. I revisited the issue of security in cloud computing, in particular highlighting specific areas that need to be addressed. I talked about the foundational elements to building an identity-based security model for your cloud environment, and how to evolve that into a full-fledged platform for your cloud applications. I also talked about the products and capabilities available in the Oracle Identity Management 11g suite, and some of our future plans aimed at specifically addressing the cloud. You can check out the presentation below (I hope to add the session audio to it at some point).